The Drunken Severed Head: Countdown Day 26 :Halloween Memories From the "Monster Kids of the Vault"
Countdown Day 26 :Halloween Memories From the "Monster Kids of the Vault"
Monsters From the Vault is one of my favorite magazines; it is one of the very best magazines out there for classic horror film appreciation. 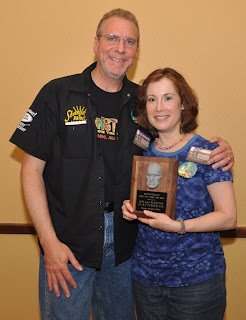 It is published and edited by monster-kids-from-the-vault Jim and Marian Clatterbaugh, seen below with their Rondo Award plaque honoring their induction into the 2008 Rondo Award Monster Kid Hall of Fame. I'm honored and delighted (not de-lit, which I never am) to have an interview with them about their memories of--and comments on--Halloweens past and present. What was your favorite/least favorite Halloween candy or treats? Marian: Favorite: Mounds bars. Least favorite: hard candy. I lived on a long street, so my bag would get full and heavy pretty quickly. I think it was my first trick-or-treating night when my bag broke and candy spilled out all over someone’s walkway. I was only about 3 years old, and my mother was with me to rescue most of the candy, so I don’t remember that it was too traumatic. Jim: Favorite: Those homemade candy popcorn balls, and Mallow Cups. Lots of the people in my neighborhood made items to give out at Halloween instead of candy, and those popcorn balls were always my favorites. I used to hit the homes that gave them out a couple of times to accumulate more. A few years ago I purchased some packaged ones at a store and they weren’t so good, so maybe I should make some for myself! Least favorite: I never liked it when people gave out fruit like apples and bananas. No kid wants healthy food in their trick or treat bag. Tell us about some of the costumes you dressed up in. 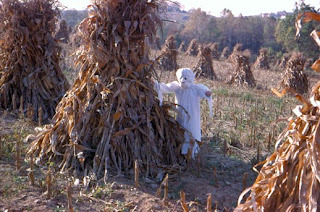 Jim: My favorite costume was a Ben Cooper Frankenstein costume. 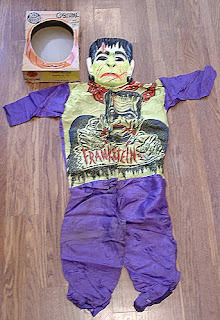 I wore that costume for years, and since I was rather tall as a child my mother had to add material to the bottom of the legs so it would fit me year after year as I continued to grow. Truthfully, that’s the only costume I can remember, and I’m extremely proud to say I have the same costume mint in a box today. I purchased it at a Chiller Theatre convention in the early 1990s. However, I, like just about every other kid who read monster magazines in the 1960s, would love to have had one of the Don Post masks and hands that were advertised within the pages of Famous Monsters of Filmland. But at $39.98 for the mask and another $19.98 for the hands, I, like just about every other kid, could only dream of that. In the 1960s that was our entire household budget for a week probably! 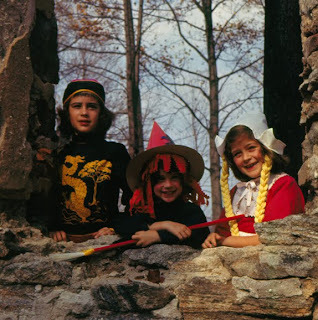 What decor and/or accessories of Halloween do you remember? Marian: I remember those papier-mâché jack-o-lanterns—wish I still had one of the originals now! I do, however, collect vintage Halloween decorations as well as new decorations, and I have a large collection of the Dept. 56 Halloween Village houses, figures, and accessories. Jim: I always liked the Halloween skeletons, monsters, witches, cats, etc. made of thin cardboard that were jointed so that you could hang and pose them on your door or window. Other favorites were the metal noisemakers that you twirled around by a handle to make noise. I guess you could call them party favors. Fortunately, Marian and I have been able to collect a few of those over the years. Costumes you’ve seen that impressed you as VERY good or VERY bad...? Jim: Very good: Truthfully, I don’t remember any truly spectacular costumes growing up, but over the years at various conventions and parties I’ve seen some truly great stuff. Very bad: Any costume that wasn’t scary. To me, Halloween is about frights so I think all costumes should be scary. No princess’ or cute costumes—not even for babies or young kids! Did you trick or treat on your own or with others? Marian: I went around with my sisters and the neighborhood kids. Jim: I always went around with the kids in my neighborhood, and then we would usually attend a party at someone’s house. Did you ever play a trick on anyone—if so, what was it? Marian: I was pretty tame—maybe soaped a few windows. 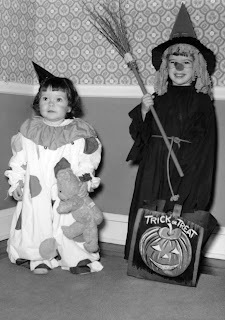 Jim: Once I was too old to go trick or treating (around 13), my friends and I would dress up, hide in bushes and dark spots, and jump out and scare the younger kids as they went from house to house. Many times they would drop their bags of candy and take off running, so we’d end up with plenty of candy even though we didn’t go trick or treating! One of our favorite things to do was build a zip line and make a ghost to slide down the line at the kids as they approached the door. This was always highly effective. Do trick-or-treaters come to your door, and if so, do you give ’em candy? Marian & Jim: Yes, unless the weather is horrible, we sit outside on the driveway by a fire pit (kind of a tradition in our court) and greet trick-or-treaters. Marian usually wears a witch hat and something festive. We average only between 30 and 50 kids a year, so there’s always plenty of candy left for us. Do you still celebrate Halloween in any way? Marian: We have a whole line-up of spooky films on hand for Halloween day and night (minus the trick-or-treating hours), and sometimes the day before and after Halloween (Dia de los Muertos, the "Day of the Dead"), depending on when Halloween falls in the week. Jim: While we haven’t done it for a while, we use to dig out our MANY boxes of Halloween decorations and do the house up, and have a Halloween party for our friends. Hopefully, this is something we’ll start up again in the near future. We publish the classic horror magazine Monsters from the Vault, and Marian collects all types of Halloween decorations (and collectibles related to the film, The Nightmare Before Christmas, which we watch each Halloween), and I collect both vintage and new monster toys (mostly relating to the monsters from the classic Universal films of the 1930s and 40s), so it looks like Halloween in our house 365 days a year. We also love this time of year so much that we got married in October (1997) and took a trip to New England for our honeymoon, which included a stopover in Salem, Massachusetts, where it’s Halloween 365 days a year. 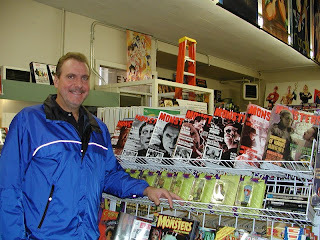 Then on our fifth anniversary in 2002, after attending the October Chiller Theatre convention in New Jersey, we made a second trip to Salem, and I had one of my greatest moments as an Editor/Publisher of Monsters from the Vault when we entered this really cool comic book shop and discovered that they had a really nice display of monster magazines—but better yet—the whole top shelf of the display was devoted to Monsters from the Vault! As you can imagine, I was smiling from ear to ear! Finally, for years I used to work at various haunted attractions during the Halloween season, and I always had a ball doing it. I guess it reminded me of the more innocent times of the 1960s when I used to scare the younger kids in the neighborhood. I keep telling myself I want to get involved with a local haunted attraction, but I always seem to have too much on my plate to do it. So until then, we at least try to hit one of the several cool haunted attractions near us each October to get a fright or two in celebration of old All Hallows Eve, to cap off our favorite holiday and time of year, and to feel like we’re kids again! Thanks for the Halloween nostalgia, Marian and Jim! 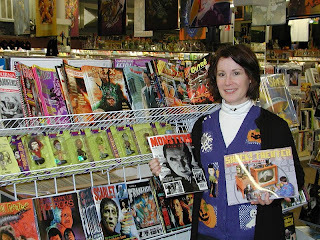 Monsters From The Vault is currently published twice a year. It's only purpose, says Jim, is "to keep the memories of the monsters of my (and our contributors' and readers') childhood alive and well." Jim and Marian succeed very well in this mission! Hi. Really interesting article. Monsters From the Vault had been unknown magazine for me until now. But I have very good first impression from it. I'll try to add it to my collection. Thanks for this interview. Monsters From the Vault is one of the most polished, fun film mags I've ever seen, and I like many of them very much!